I'm sure upper elementary and middle years students would enjoy it but it wasn't for me. I don't think it needs to be in a YA section in a school library but some may chose otherwise. Beware the perils of relationships in middle school ... they are filled with bad choices, misinterpretation of events and immaturity.Arthur Bean is back from camp and full of news. He has an enviromentalist, vegan girlfriend named Anila who lives in Calgary. He and Robbie Zack plan to work together on the next blockbuster screenplay. He still plans to be a part of the Newspaper Cub with Kennedy. It seems like it's going to be a great year. But there are some complications. Arthur can't help but feel guilty about the camera he and Robbie "borrowed" from Arts Camp to help them film their movie. And now that Arthur has a girlfriend, Kennedy seems more interested in hanging with him. What's that about? And why is this annoying kid named Von barging into the middle of Arthur and Robbie's movie? He's such a jerk!Arthur tries to sort through this life, but things are just so confusing. He'd like to be able to discuss things with his Dad, but his dad is still emotionally unavailabe. All he seems to care about is his Yoga. To make matters worse, Arthur dumps Anila for Kennedy. But then Kennedy suddenly doesn't have the time of day for Arthur and wants to be "just friends." Finally, best friend Robbie is having all kinds of turmoil in his life with his brother, Mom and Dad and seems to withdraw from Arthur.The story is told in journal writings, class assignments, newspaper articles, emails, texts and other forms of written communication. Another hilarious middle-school book from Stacey Matson!If you read this as an adult, you are reminded of the horrors of hormones, egocentric single-mindedness, and how silly and/or awful teenagers are to each other.As a younger reader reading this, I hope they relate to Arthur and his cohorts, and understand that this AWESOME time in their life is but a brief moment in their lifetime.As with Matson's previous book, there's awkwardness and real-life hardships. It didn't quite have the same heart-strings being pulled, but still an awesome continuation of the Arthur Bean trilogy!Woot Calgarian author!! 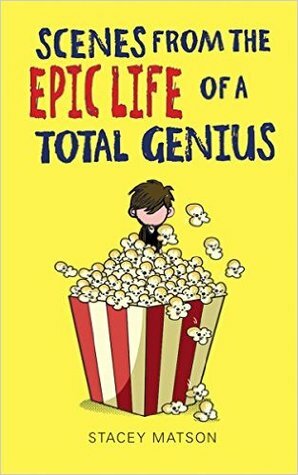 I thought this book was good, it did not make me laugh as much as the first one and I think it might have been better off if it was only one book.